Morning in the town of Lo de Marcos. The streets are still quiet and clean. Just a few stray dogs and shopkeepers unlocking their tiendas. In an hour or so, people will start throwing plastic bags and aluminum cans in the gutters and the ranchera music will fire up and torment me with relentless tuba bass lines. One thing I have realized since I arrived in Mexico is that I hate hate hate the tuba. But it is inescapable. It reverberates in your chest, in your brain. It follows you to bed at night. For the past few weeks back in Yelapa, I have avoided the internet (too slow) and the phone (only one working payphone in town near a fly-infested fruit stand). It’s been nice. I never know what time it is, or what day. I live in an outdoor palapa and notice the moon. We have coconut trees in our house, and frogs, and ants that haul the dinner leftovers away each night. There is not much nightlife here, so we have spent entire evenings marveling at them and filming them while they carry away whole pecans and green onions. One time they diassembled and carried away a pomegrante. Amazing. Someone said they are the strongest force on earth. There are no cars in Yelapa and I don’t miss them. The soundscape is beautiful without horns, without the rev of engines, or the squeal of breaks. Every morning it’s just the clop-clop of horse hooves, early waking roosters, happy dogs barks, the breathing sea, and children singing songs full of corazon. Yellow birds birch in our palapa trees and make the nicest calls. My bed hangs near the ocean so I can wake and look at the ocean and watch fishing boats bob up and down, watch frigate birds circle the bay. Sometimes there are dolphins, occasionally a whale. My mind is clear as morning sun. Delightfully blank. 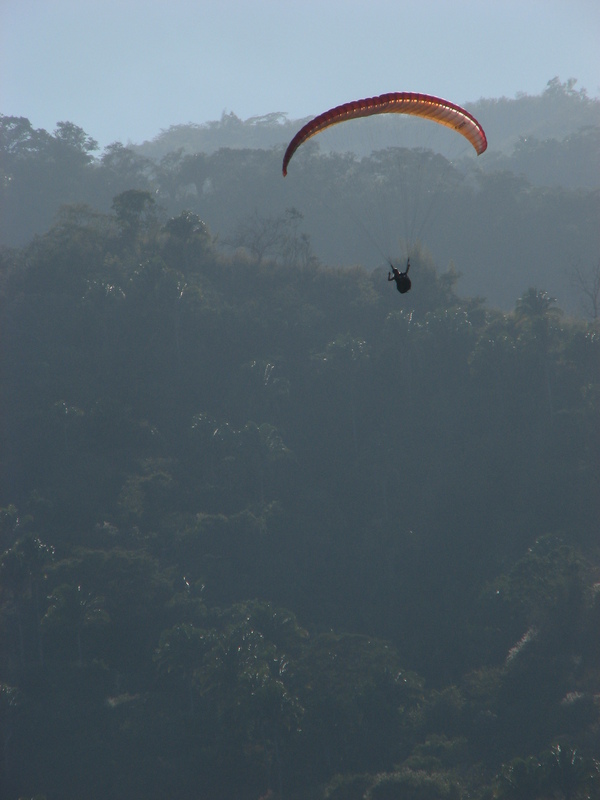 I’ve been paragliding in the afternoons, hiking up the 600 foot drainage up to launch. I’ve flown nearly everyday since I arrived am getting comfortable in the air. Vultures and frigates teach the pilots how to thermal. Sometimes we are joined by macaws, in pairs. The pilots land on the beach and drink margaritas and beers everyday and I have adopted this habit. For the first couple weeks it was novel, but now I am beginning to wonder how much is too much. It’s all too easy to sink into a beach chair, sun overhead, cocktail in hand, and just stare at the ocean. Some people do it their whole lives. It’s a sort of Mexican-motif, isn’t it? People bailing out of marriages, failed businesses, and other hardluck scenarios to spend the rest of their lives beachside. A little deterioration is okay, I think. Sometimes you have to let parts of yourself go to wake up other parts. But I wouldn’t want to loose track and end up listless, overtanned, and cast into a permanant angle of repose. I plan to return home before that happens–before I drink too much, or write too much bad poetry. My time here recedes and so I enjoy the last ocean flights, the dwindling margaritas, and my temporary bonds with stray dogs, who are always open to love or a good game of fetch, retreiving tossed coconut husks from the bay.